The application rate for any termiticide is 1 gallon per 10 square feet. So you will need 90 gallons of mix to cover 900 sq. feet. You also need to use 90 gallons of water. The labels don't allow mixing in less water. 240Ml bottle of Premise makes 20 gallons of mix. You will need 5 bottles to make 90 -100 gallons. 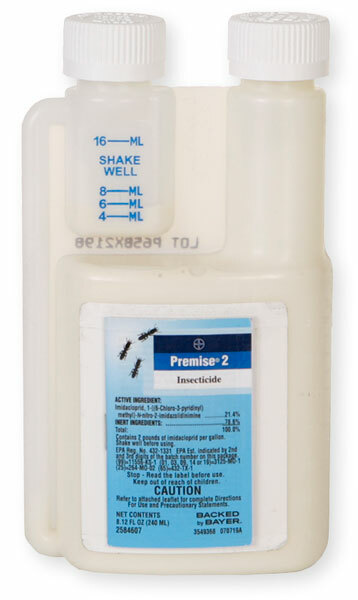 If you have to use an Imidichloprid product, then Dominion 2L is the cheapest. Use (2) 27 oz bottles to make 100 gallons of mix. Termidor 78 oz makes 100 gallons of mix and is on sale. That's what I would use if it were my property. It mixes at .8 oz per gallon of water. The bottle has a built in measuring cup to make it easy to measure and pour. Premise has 3 - 5 year life, Termidor has a 15+ year life. That's why I prefer Termidor.